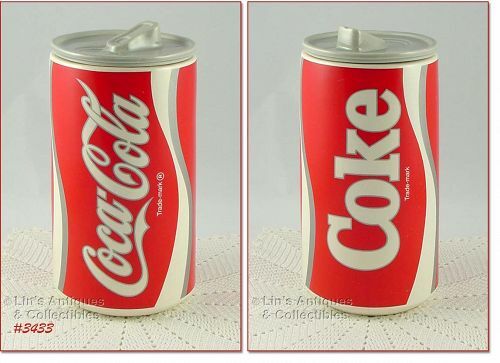 This is a super McCoy cookie jar – it’s the Coke can cookie jar! Measures 9 ¾” tall (to rim) and bottom is marked 1003, USA. It has a couple teeny flecks of missing red color – that’s it! Very nice McCoy cup from the Spirit of ’76 dinnerware line! 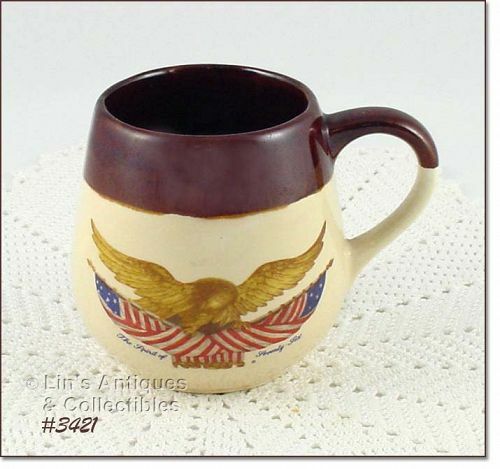 This one is unusual and not your everyday find – it measures 3 ¼” tall, has the eagle decal, and bottom is marked USA. Cup has gold trim at rim and other than minor wear to this trim, it is in excellent condition! Neat. Definitely one of McCoy's most peculiar planters and a difficult find -- this is Cope's "faces" planter! It's in the colors of rustic line, measures 5 3/4" tall, top is 6 3/4" x 5 3/4". One side has 4 faces peering from leaves, other side has 3 faces. Planter is in great condition with no chips, no cracks, no crazing. Has been used as intended and it has interior staining. Neat item, highly sought by collectors. This is an excellent cooky press! It has 8 discs and one tip (tip is for cream puffs and Schaum tortes). There is an instruction sheet that also has recipes on one side. Press doesn’t have a box. This is a neat pottery item and a perfect bowl for a pampered kitty! Bowl is shaped like a curled up cat – has holes at the eyes that I would surmise originally had rhinestones and there’s a hole in back for some sort of tail (?) -- I really don't know because I have never seen a bowl like this! 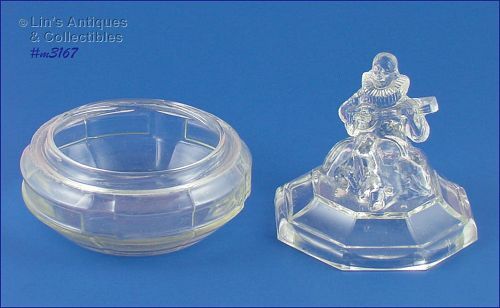 The bowl portion measures 5 ¾” x 4 1/8”, the complete measurements are 7 ½” long, 7” wide, and 3 1/8” tall. This is a very pretty McCoy wall pocket! 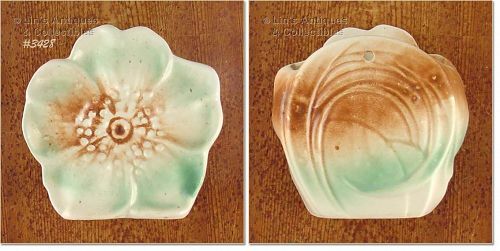 It’s the flower blossom wall pocket made in 1945 and is in the pretty rustic line colors. Wall pocket is in super condition – no chips, dings, or cracks! It has been used as intended and has a faint stain line – that’s it! Reference books call this unmarked McCoy item an “Ice Jug” but I would describe it as a ball shaped pitcher. It’s from McCoy’s pretty Hobnail line of 1941 and is a pastel lilac/pink color. Neat advertising piece! Made by McCoy for Sambo’s Restaurants, cup has patriotic stars and stripes design. Marked USA, cup measures 3 5/8” tall, and is in super condition – no chips, dings, or cracks – has interior crazing that has slightly discolored (from coffee) – that’s it! Cup is a very collectible advertising item. 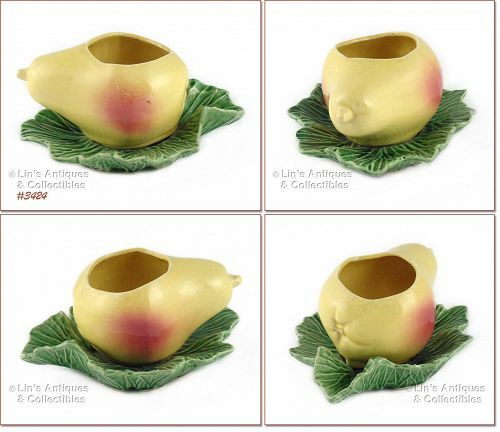 This listing has an extra nice McCoy fruit shaped planter! This is the pear on leaf and bottom is marked McCoy, USA. Planter has no chips, dings, or cracks! It has been used as intended and has minor crazing. Interior has in-mold initial “s” and bottom still has original ink price of 69 cents – wow! 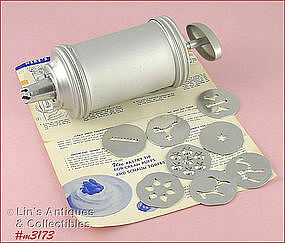 Another super nice Mirro aluminum cooky pastry press! Press has 3 tips, 13 discs and recipe/instruction booklet. Set is in wonderful condition – the tree design disc has a dent on edge and the box shows some wear (the cellophane cover is missing and the lid has some tears). Very nice glass powder jar titled “Minstrel” and is clear glass! Jar is in very good condition – it has a couple rough spots (teeny dings) on jar rim and on lid rim – not unusual. The back of the instrument has a couple teeny dings. Great addition to a collection! 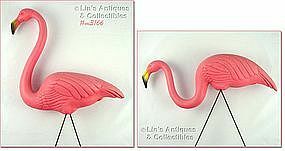 This listing has a pair of plastic pink flamingos! They have been displayed but are not faded and they have been stored in their original box! They each have 2 metal rods for legs – insert underneath – then stick in ground. Neat garden accents! 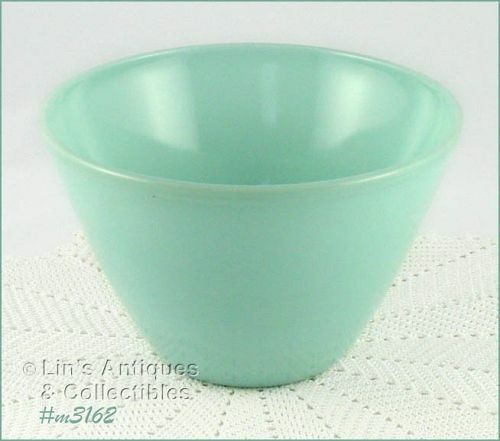 Very pretty light blue color Fire-King mixing or serving bowl! Marked on bottom: Fire-King, Oven Ware 15, Made in U.S.A.
Bowl measures 6” tall, 8 ½” diameter and is in excellent condition! 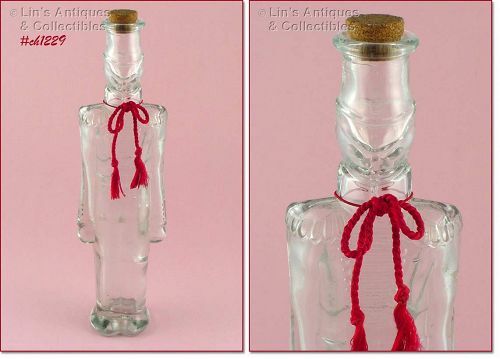 This listing has a neat glass cork top bottle shaped like a toy soldier! It measures 14 ½” tall and it doesn’t matter if you turn him front or back – the mold is the same – frontal view! Bottle is in excellent condition – no chips or cracks. Glass has some manufacturing bubbles, etc. 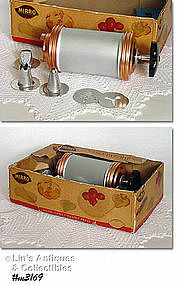 Other than “MSRF” on bottom, there is no manufacturer identification. This is a pretty holiday display piece – a glass sleigh! It measures 4 3/4” long, 3 1/4” tall, 3 1/2” wide and is in excellent condition. It has black and gold paper label/sticker: 24% Lead Crystal, Made in USA. 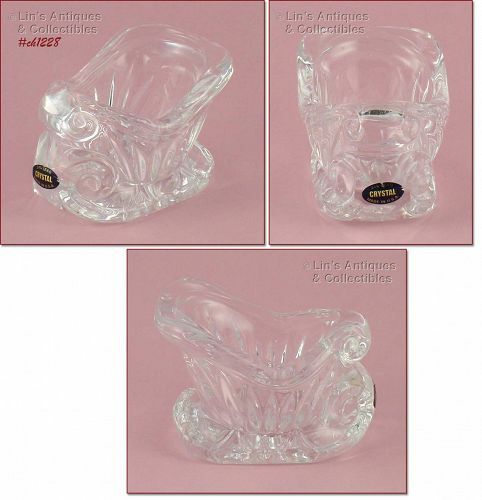 There are so many uses for this item – fill with candy, a votive candle, fill with pretty guest soaps or potpourri, or purchase and display with our item #CH424 a lead crystal Santa! 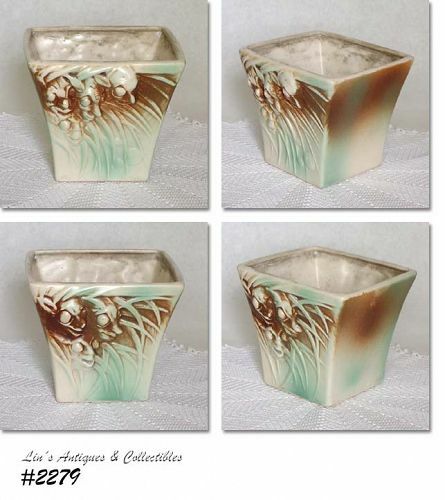 This listing has a beautiful, mint condition McCoy vase! This pattern doesn’t have an assigned McCoy name so I have named it pink peony. 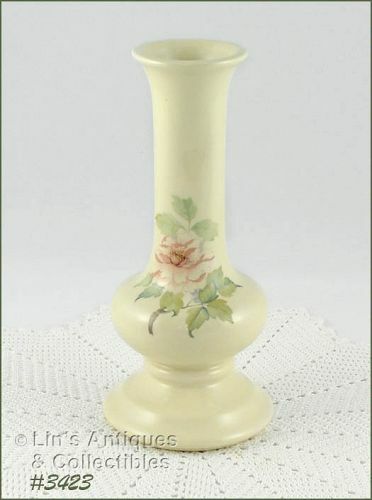 Vase measures 9” tall and bottom is marked 411, USA. It has a paper label attached to bottom that reads: Nelson McCoy Pottery Company, Roseville, Ohio 43777 and has the Lancaster Colony logo. 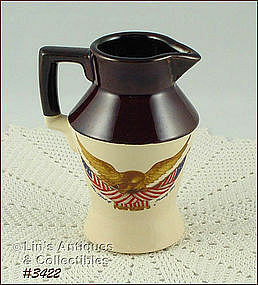 This small McCoy pitcher is the perfect size to hold syrup! Pitcher is from the Spirit of ’76 line and measures 5 ½” tall. Decal is intact and bottom has the Carved Wooden Eagle description. Pitcher is marked: 335, McCoy, USA. Excellent condition! Excellent condition McCoy Spirit of ’76 mug! Decal is intact with no scratches or mars. Bottom of mug has: Carved Wooden Eagle, Artist Unknown, National Gallery of Art, Washington, D.C. This is McCoy’s rounded shape mug and is marked: 7025, McCoy, Lancaster Colony (mark), USA.